Note: we are adding support to all countries over the next few months. Contact us if you have any input or questions. In order to add new countries or local and/or mobile support. Go to manage search engines. 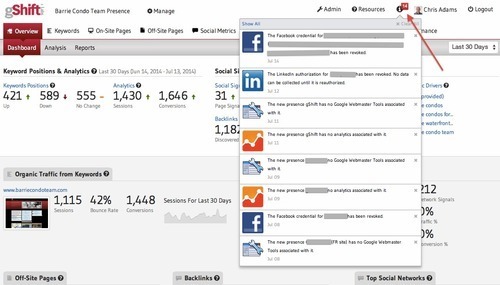 New Clients – If you have recently set-up a new client and missed authorizing a data connection such as Google Analytics, Google Webmaster Tools or any Social Platform, then we will alert you via notifications within 48 hours. It will appear as a red number beside the “i” (information) icon. You can choose to ignore the notifications by clicking the “x”. Or you can click “show more” and see all of your recent or past notifications. Google Analytics or Google WebMaster Tools – If there have been changes to your email account or another issue, which has caused your Authorization connection to be dropped, we will immediately alert you to this issue so it can be re-authorized. We back-collect your data, so don’t be worried about any missing data. Social Platforms – Most of the social platforms have a time limit for a data authorization. For example, Facebook requires all marketers to re-authorize every 60 days. This is done for security and privacy protection purposes. Therefore, if we see your token coming up for renewal or if the deadline has passe and your account has become inactive in gShift, we will alert you. Agency users who are managing multiple clients with multiple social accounts will get multiple alerts for each social account and/or client. You can click on the alert and it will direct you to the appropriate authorization management page. Alert me when a new piece of content ranks in the Top 50 in Google. Alert me when my web site climbs into or drops out of the Top 10 for a specific keyword. Alert me when my web page acquires a new, verified backlink. Alert me when Google Webmaster Tools uncovers a 404 error for any of my pages or any other GWT alert. 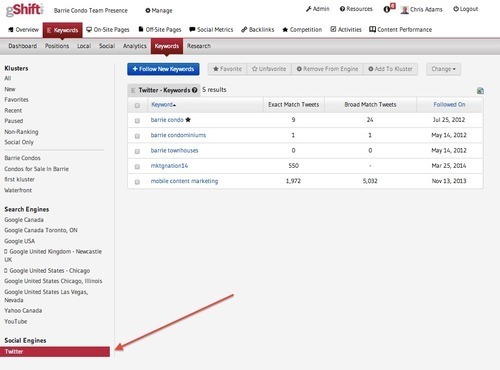 Social keyword research has its own panel in gShift. We have added spark line graphs to enhance the “real-time” nature of the data and to also point out if there are ups and downs when exact match keywords are found in Twitter. We believe the overall presentation has improved. 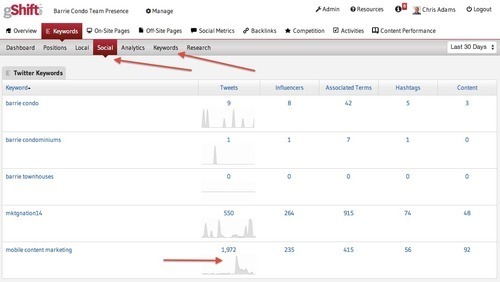 The managing of social keywords has been moved into the central keyword management section of gShift. You can now control Klusters, Engines and Social Engines (Twitter) from within this centralized interface.